The Galaxy S6 includes 4 screen modes: Adaptive display, AMOLED cinema, AMOLED photo, and Basic. 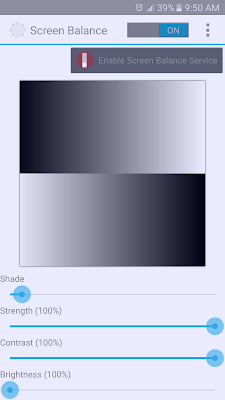 Basic mode is the most color accurate with saturation significantly reduced but usually appears to have a yellow tint. Our review of the Galaxy S6 noticed varying degrees of yellow tint in basic mode across several devices. The Galaxy S7's color calibration is a lot better with most devices having a neutral white in basic mode. If you have a Galaxy S6, use basic mode, and noticed the yellow tint, all is not lost. 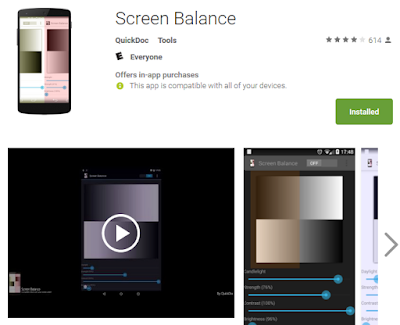 Luckily Android N will save the day with color balance calibration but until that's released there's an app called Screen Balance that helps turn yellows into white again - without rooting. You'll need to click ON at the top. The app recommends turning on the service (in the More option) so that it doesn't interfere with certain apps (most likely games) but I didn't experience any interference. Move the first slider until the background looks white. It's easier to find the right tint in a dark room so the screen isn't reflecting bluish sunlight or yellowish light bulbs. I found Shade with Strength at 25-50% or Twilight with Strength at 76% work best for me. Set Contract, and Brightness to 100%. You should now see a much closer to white screen. Unfortunately you'll notice that taking screenshots will look blue because the app is applying a blue filter on the display to correct the yellow tint. You'll also see the app running at the top left as a circle icon and appear on your lock screen. You can turn those off by going to Settings, Notifications and turning off notifications for Screen Balance. Close all apps will revert the screen back to the yellowy colors. There's also a chance Android may close the app as part of memory management but I haven't experienced it yet. As for battery life, I didn't notice any noticeable difference between having the app on to previous battery life without the app. Overall, if the color balance on your Galaxy S6 bugs you enough, it's worth giving Color Balance a try. If you opt for the Pro version ($3) then it'll allow better fine tuning using RGB. But waiting for Android N's system level color balance calibration may be the better choice.